The main difference between human rights, legal rights and moral rights lie in their aim and impact on the individual. 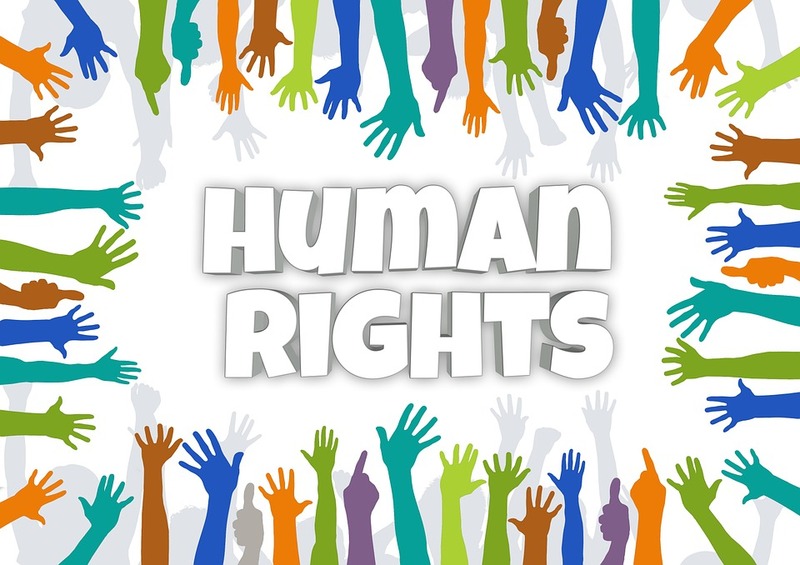 Human rights are those that emphasize the universal rights any person can enjoy and, legal rights refer to the rights a particular person is entitled to enjoy legally as enforced by the state/government whereas moral rights emphasize the universal ethical rights /guidelines the people can follow. Knowing someone’s rights as an individual and a citizen of a certain country is essential when leading a peaceful and just life. It is important to note that human right and moral rights come under natural law while legal rights come under the law of state governments. The right to social protection, to an adequate standard of living and the highest attainable standards of physical and mental well-being, etc. Hence, human rights are those that are inherent to all human beings in spite of their nationality, religion, age, ethnicity, gender or any other distinction. They contribute to ensuring every human being to live without any discrimination from anyone. Universal human rights are often described and confirmed by law in treaties, customary international law, acts, etc. Moreover, international human rights law describe the obligations of all the governments of the countries in the world to protect these universal human rights and ensure the fundamental freedom of humans. Nevertheless, the protection and the recognition of human rights also vary from country to country even though many countries have already purported to recognize human rights through their constitutions, statutes, or international treaties. This distinction arises with the way how these rights are protected and safeguarded in the practical scenario. 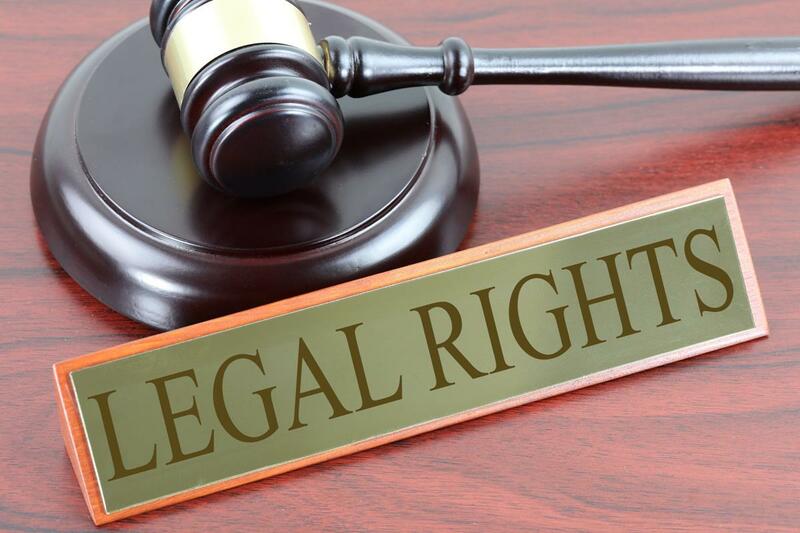 Legal rights refer to a set of rights formulated by the legal system of a government. They are given as privileges to the citizens of that particular state. Thus, they are those liberties or protections of individuals that are originated through the laws. Hence, they are bestowed onto a person by given legislation of a country. Similarly, they can be modified, repealed, and restrained by the same laws. In brief, legal rights are the privileges given to citizens by their governments. Hence, these liberties/right are created and enforced by the legal system of governments, which also means that they can also be redefined or altered by the same parties. Similarly, these are not universal, but they vary from state to state and country to country, person to person, even from time to time as well. Thus, one of the most significant features of legal rights is that they are formulated by the state or government according to the majority’s desire for the common good of its citizens. Therefore, they are not universal or timeless like human rights and moral rights. However, they affect every citizen in that particular state, whether or not the citizens publicly know the existence of such. They come in acts, constitutions, statutes, laws, etc. They are liable to change accordingly as well. For instance, the legal rights of a person having dual citizenship may vary from someone having single citizenship. Moreover, in some countries the legal right to vote varies in age, i.e., in the US, the legal right to vote is from the age 18 and above. Moral rights are rights that are accorded according to the universal ethics or moral code. Moreover, their nature is similar to that of human rights; universal, concrete, and timeless and are not formulated by people according to the national or social desires. Hence, the origination of human rights is the emergence of laws and statues, etc. Moreover, there is a strong link between religious and ethical code and moral rights as morality is defined by the religious and moral teachings of mankind, which create the system of ethics in human societies. In brief, moral rights are those that are recognized as morally correct or acceptable for the common good of mankind. Therefore, they are not formulated by any state or any authority of a country, and they do not vary from country to country and person to person either. Likewise, moral rights stand as the fundamentals for the identification of rights to humans as well as animals. Similarly, there is no follow up penalties or punishments for the violation of moral rights. However, when a moral right/human right is identified as a legal right, violation of that right is followed by punishment as a legal right. All human rights legal rights and moral rights pertain to the rights an individual can enjoy which helps him to enjoy a free, just and fair life. Furthermore, both human rights and moral rights can be identified and accepted as legal rights according to the state’s needs, and then they are given the nature and outlook of legal rights: penalties and punishments for the violation of them by any party. Moreover, the law ensures that human rights, legal rights as well as moral rights are protected, leading to quality lives of humans. Besides, moral rights stand as the basis for human rights and legal rights. Likewise, moral rights and legal rights are significant to understand the nature and the application of human rights. Human rights are the universal rights any human being can enjoy while moral rights are the rights that are accorded according to the ethics or moral code, and legal rights are the rights formulated by the state or government for the privilege of its citizens. Thus, this is the main difference between human rights legal rights and moral rights. Moreover, one more difference between human rights legal rights and moral rights is that the human rights are those that are universal; any human is entitled to these rights. Therefore they are universal and timeless. Legal rights may differ from person to person depending on their age, nationality, country, etc. while moral rights are universal like human rights. There is no exact punishment by law for the violation of human rights; however, based on the conventions and agreements, the law can be enacted in order to ensure human rights are protected and not violated. Similarly, there are no entitled punishments for the violation of moral rights as well. On the other hand, there are follow up punishments and penalties for the violation of legal rights by anyone. However, if any government identifies and formulates any of these human or moral rights under the legal rights of that state, then they also follow up punishment for the violation of them. Hence, this is also a major difference between human rights legal rights and moral rights. Human rights and moral rights are both natural rights; they are universal rights and are not given by governments, so they exist even if there is no government. On the other hand, legal rights are rights given by the law of a state; privileges given by the state/governments to its citizens. So, this is another difference between human rights legal rights and moral rights. In brief, human rights, moral rights, and legal rights are rights that humans are entitled to enjoy in their lifetime. Human rights and moral rights are natural rights while legal rights are not. 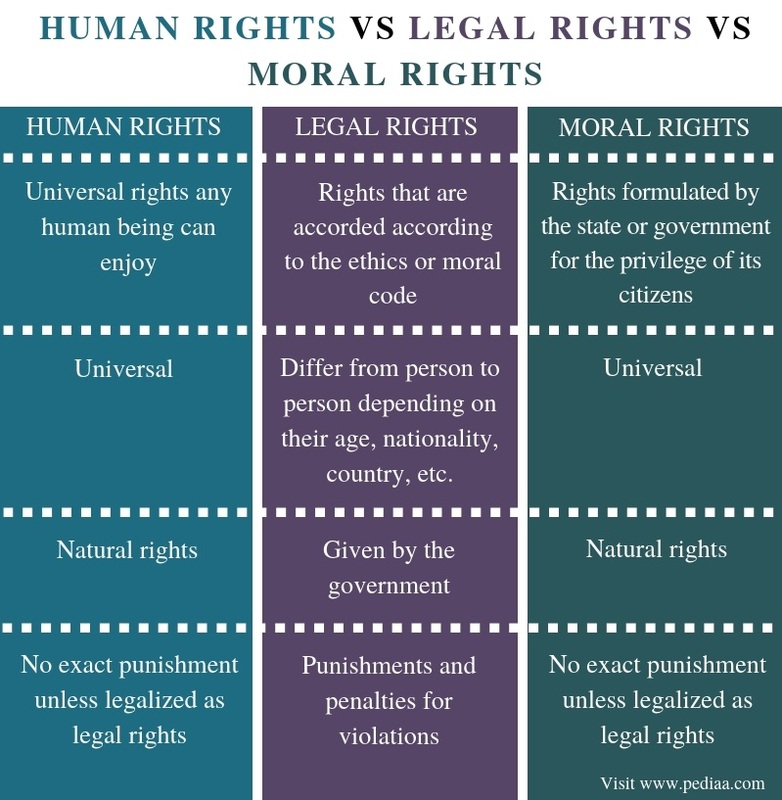 Human rights are those that emphasize the universal rights any person can enjoy while legal rights refer to the rights a particular person is entitled to enjoy legally as enforced by the state/government, and moral rights emphasize the universal ethical rights /guidelines the people can follow. Thus, this is the summary of the difference between human rights legal rights and moral rights. 1. “Human Rights.” United Nations, United Nations, Available here. 2. Regan, Tom. “Legal Rights and Moral Rights An Animal Rights Article from All-Creatures.org.” Pharmaceutical Cruelty Down on the Farm: Consumer Beware – The Meat and Dairy Industry – An Animal Rights Article Series from All-Creatures.org, June 2011, Available here. 3. Capron, Alexander M. “Legal Rights and Moral Rights.” SpringerLink, Springer, 1 Jan. 1976, Available here. 4. “Natural and Legal Rights.” Wikipedia, Wikimedia Foundation, 21 Jan. 2019, Available here.